Early November, Adisseo attended the first China International Import Expo (CIIE), which took place in Shanghai. This event attracted over 3,000 companies from more than 130 countries and regions. 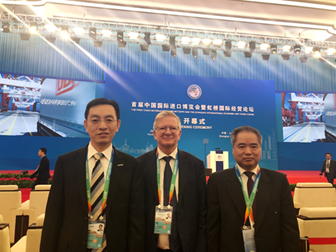 About the CIIE, Jean-Marc Dublanc commented that this event sends a signal of China’s openness and transparency, and that as China is one of the major production and consumption markets for products from agriculture, Adisseo is confident in the company’s ability to capture faster growth on Chinese market. As an illustration, Adisseo signed partnerships with Zhengbang Group and New Hope Group – two strategic and long-term partners – around cooperation on Rhodimet and rumen product MetaSmart. This signing ceremony was attended by Mr NING Gaoning, Chairman of ChemChina Group. Adisseo also reached a partnership agreement with Fujian Sunner Development Inc.
Fujian Sunner is a leading enterprise in feed processing, chicken breeding, chicken egg hatch, broiler breeding and slaughter fields. During the CIIE, Adisseo’s booth attracted a big number of visitors from China and overseas engaged in poultry farming or dairy cow farming business. The opportunity for Adisseo to introduce its whole category of methionine products and patented innovative products to all visitors.